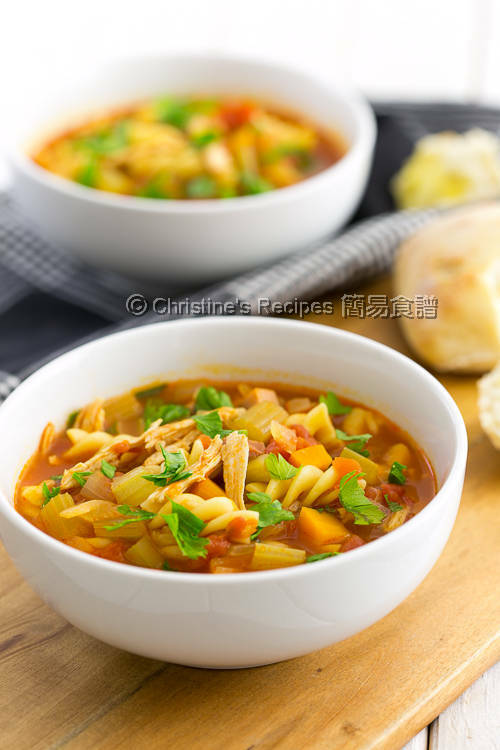 This soup recipe can be served as a base to make your own using up your leftovers. Both instructions of using Instant Pot and stove-top are inserted. Enjoy! This is one of my favourite meals, packed with flavours and nutrients. If you have an electric pressure cooker, Instant Pot, it can be done within 20 minutes. 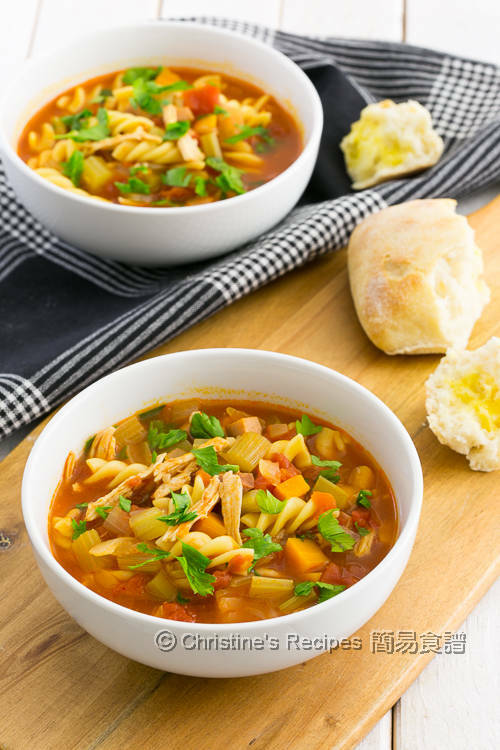 Or without an Instant Pot, you can also make this delicious soup dish with a large pot on stove at ease. What I like about this soup dish is that it’s fast, delicious and comforting. Best of all, I can make a good use of any leftovers in my fridge. After Christmas, you might have some leftovers too, might be different from mine, like ham or turkey. Select “Saute” programme (medium) to heat oil. Saute the garlic, onion, carrot and celery. Pour in the diced tomatoes with juice. Add the bacon, chicken, rosemary and bay leaf. Stir to combine. Pour in the chicken stock. Add the pasta. Cover the lid with the pressure handle to “sealing” position. Press “Soup” button and cook for 12 minutes. Run quick release. Drain out the chicken. Shred with two forks. Toss back into the soup. Taste first. Season with salt if necessary. Sprinkle pepper. Garnish with chopped parsley. Serve immediately with crusty bread if desired. Prepare all the ingredients as above, except top up with ½ cup of water. Use a heavy based large pot to heat oil over medium heat. Saute the garlic, onion, carrot and celery. Pour in the diced tomatoes with juice. Add the bacon and chicken, rosemary and bay leaf. Stir to combine. Pour in the chicken stock. Bring it to a boil. Reduce heat to medium low heat. Simmer until the chicken becomes tender. Add the pasta. Cook referring to the instructions on packaging, with one or two minutes less, in order not to overcook it with residue heat inside. Drain out the chicken. Shred with two forks. Toss back into the soup. Taste first. Season with salt if necessary. Sprinkle pepper. Garnish with chopped parsley. Serve immediately with crusty bread if desired. I used raw chicken breast, and cooked for 12 minutes on high pressure. If using cooked chicken, the cooking time can be reduced to 10 minutes. When using Instant Pot, don’t use the smallest trivelle pasta, and make sure not to cook over 12 minutes. Or else, the pasta will be too mushy. If you want to fully control the pasta texture, you might cook it in another pot. Then add the cooked pasta into the soup. For convenience, it’s no harm to cook the pasta with other ingredients. As the bacon is flavoured and salted, taste before seasoning. 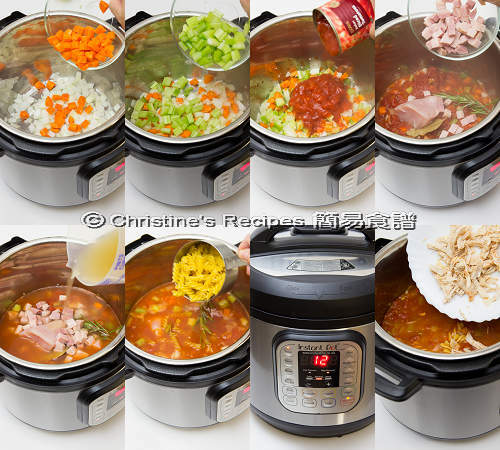 I can tell that you love your instant pot :-) The soup looks so comforting, delicious yet very healthy. You're right. I love my Instant Pot very much and nearly use it everyday.